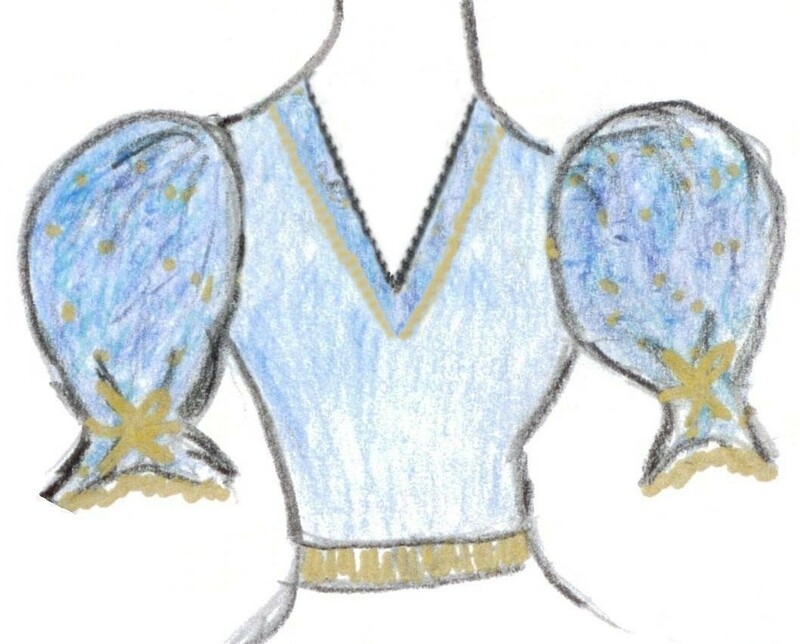 "OFFICIAL STATE SQUARE DANCE OUTFIT"
What follows is a description, written by Anita, describing the making of the Dress or skirt, blouse and man's tie. 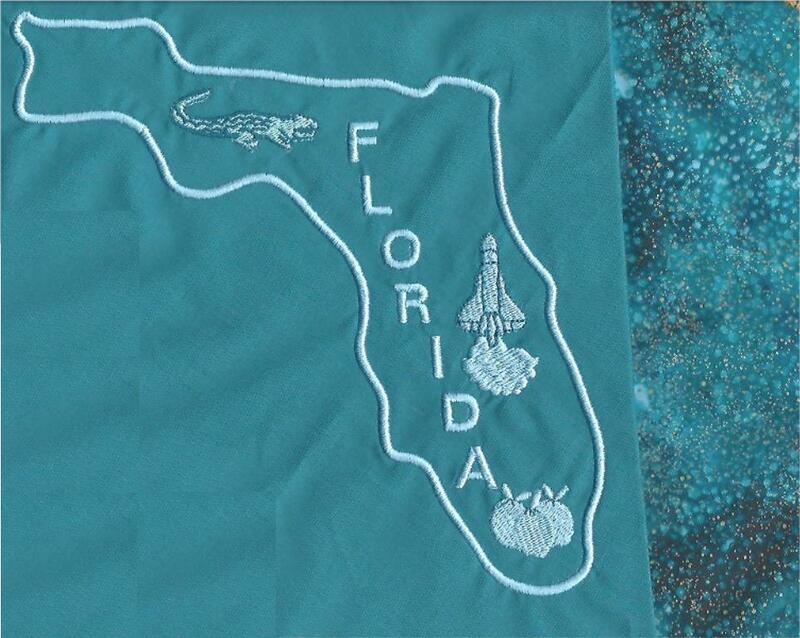 This is the new Federation Dress voted on by the delegates of the Florida Federation. Thanks goes out for all the suggestions for the dress and especially the committee of ladies, that worked with me to design this dress. This can be made as a dress or skirt and blouse. I believe it could also be made in a long version. However I would make the gores going all the way down, instead of the gathered panels going around. You may want to leave off the ruffle. The state logo is the same logo used on the previous dress. If you have the that dress, it is suggested that you take off that logo and use it on this dress. Each Association probably has a few of these logos left over from last time. The solid color reminds us of the ocean. The print looks like the sand after the tide has left. This dress is different from the previous dresses we have had. I hope you enjoy it. ** Please note the ruffle is attached on the outside of the dress, not the inside. 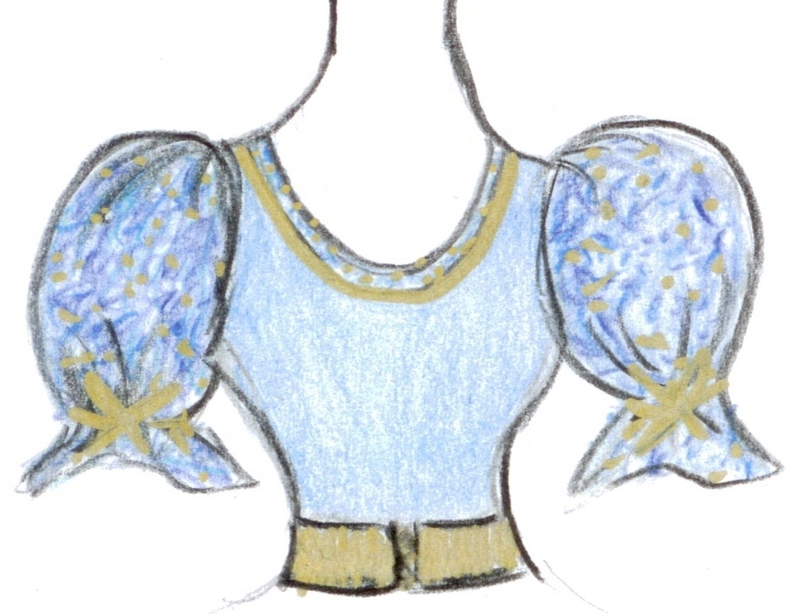 Also the picture has gold decorations on the bottom ruffle and at the bottom of the neck facing and a ribbon on the sleeve. I did not put that in the original directions, however some of the women have made the dress with these additions. 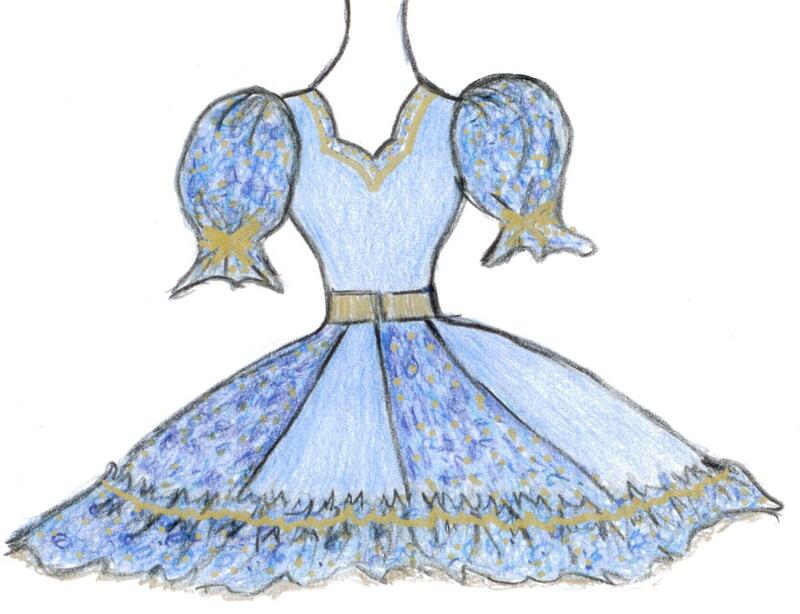 I have seen the pictures and I believe that this does enhance the dress and should be added to be uniform. 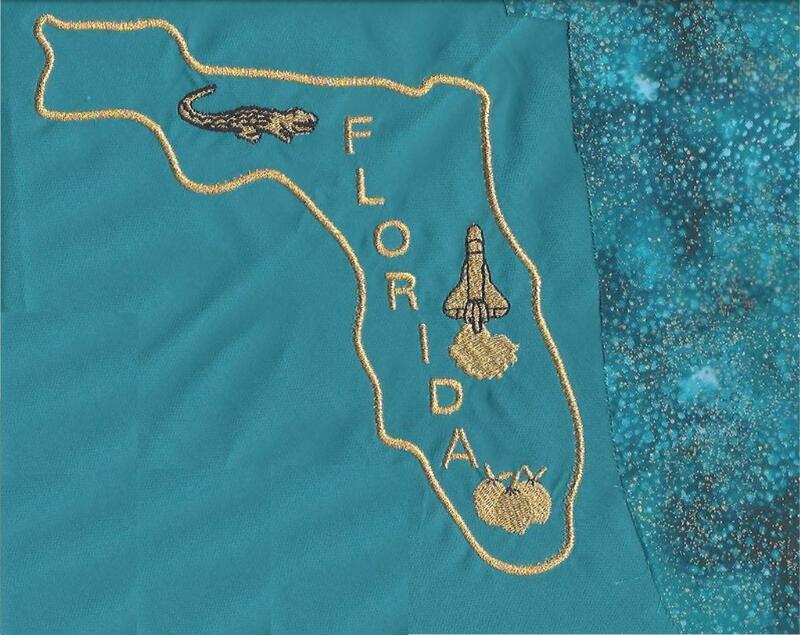 Also hold off on putting the state of Florida emblem on the dress as Cheryl is experimenting with making a little change to the emblem. I will let you know as soon as I can about this. Material can be bought at Wal-Mart and Jo Ann's. 4 yards of the solid fabric - Purchased at Wal-Mart. You may want to order more for a man’s vest. If you do not have a Wal-Mart in your area that sells material, someone can purchase the solid color for you. I have already requested 2 more bolts at my local Wal-Mart. However, you can ask for it at your Wal-Mart. When you go to Wal-Mart to purchase your material, it might be helpful to take the print material from Jo Ann's to be sure the color matches. The fabric at all Jo Ann’s is ordered when the supply gets low. If you Jo Ann’s doesn’t have enough of the fabric, you can request that they special order it. You can use a coupon even if you order. Also, if several of you go in at the same time and order the fabric you can use the same coupon. You do have to pay for it in advance. The skirt is your standard 8-gore skirt with alternating panels of the solid fabric and the print fabric. You will need 4 gores of each color. Arrange the skirt so that the print panel is in the middle of the front, with a solid panel on each side. The state logo is to be placed on the solid color panel on the right side of the front of the dress. An approximate 6-inch ruffle will be added to the bottom of the gores. The print fabric will be used to make the ruffle. 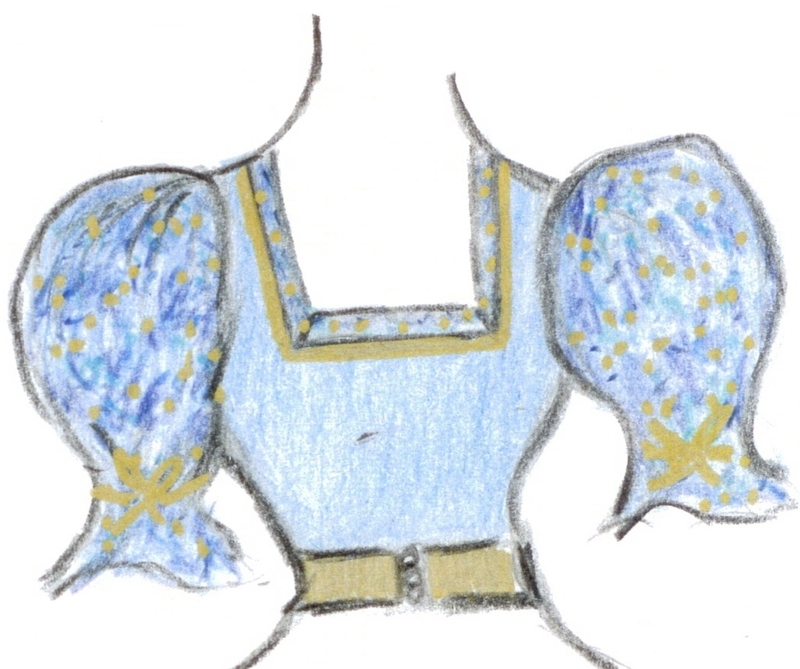 The bodice would be made of the solid fabric using whatever neckline you would like to make. Since not all people like the same neckline, you can choose what neckline you want. The number one choice is the sweetheart neckline, but you could use a round neckline, v-neck or square neckline. The uniformity comes in the way the neckline is accented. You would use about a 2 inch accent of the print fabric on the outside of your neckline. I would suggest using two facings on the neckline. The one on the inside of the bodice of the solid fabric and the other facing of the print fabric on the outside of the neckline. The sleeves would be your favorite puff sleeve, made out of the print fabric. In the middle of the sleeve at the elastic band, we suggest a gold bow with ribbon hanging down a little. This dress can be worn over a gold, white, or same color as the dress crinoline. . You may want to accent the dress with a gold belt or a belt made out of the print. Men have it easy. They should wear navy blue pants with a white shirt. It would be very hard to find a man’s shirt in these colors. The men could have a reversible vest if they like a vest. They should have a tie made of the print fabric.